How can i possibly sum up my first impression of Dubai? It is unlike any place i have been to. It is impossible to string together a few sentences to sum up such an extravagent and diverse place. i would liken it to the task of putting together a 5000 piece puzzle with no picture to guide you. The pieces are all there but before you can construct it you have to sort out all the edges, corners and make sure each piece is right side up. Even once that task is complete, the thought of assembling an unknown picture can seem daunting. i became a sponge the moment i entered SF international airport. It was as if i had never been to an airport before and i attempted to take it all in as a fully as possible. Flying to a different country for a vacation is VASTLY different than flying for the purpose of moving your family into a entirely new hemisphere. Everything i encountered was processed through my "mommy filter." What will my kids see, feel and experience? The first realization hits me even before my feet leave SF. Descending down the escalator to our gate where we would catch a direct flight to Duba, i encounter a sea of Indian faces and brightly colored saris. Our flight would hold about 300 people and of those 300 there where approximately 6 westerners. Of those westerners, i was THE only blonde (natural or otherwise ahem). Nobody seemed to take notice of the token blonde girl but for the first time in my little USA life i was the minority. And you know, i like that my kids will have that experience in their pocket sooner than i did. The night we arrived in Dubai, Chris and i checked in to our hotel and took a stroll along the marina. He asked me what my first impressions were of the city and i was amazed that i wasn't surprised by anything i had seen yet. i'm sure it's the hours, possibly days i spent reading up about the history, culture and rise of Dubai. However, stepping out of the pages and onto the street can provide you with a whole new storyline. Part of piecing this experience together is realizing there are American bits and pieces everywhere, some expected some not. Ja! It's the real deal, complete with brats, beer and an authentic oompah band straight from Germany. Dubai appears to be an ever whirling kaleidoscope of sounds, sights, smells of cultures. The marina is a perfect example. Walking out into the marina the evening weather in October is a perfect temperature, balmy with a slight cooling breeze. The scent in the air is a mingling of sea salt, dessert sand, and fruit sweetened shisha. Dark haired little girls are playing in the water fountain as mom and dad snap pictures. On the local restaurant patio a group of muslim woman are celebrating a baby shower for the newest arrival.... a little girl. i know this because a few of the woman have their heads covered with a simple scarf and the ballons tied to the backs of their chairs are the same "It's a Girl!" ones i find in my grocery store at home. Ahead of me is a couple holding hands and quietly speaking in french. We walk past another outdoor area where elegant and cozy couches house beautiful Emirate nationals. Couples spending an evening together in any culture look very similiar. The women sit closely as they giggle and share the local gossip in arabic while their husbands sit adjent to them discussing whatever it is men discuss. Their body language is a mirror image of what i would find in my own home when it is filled with close friends. The only difference really is that the women are wearing abayas while the men are wearing the traditional Kandoura. It's hard not to be captivated by their exotic beauty as they sit with the shisha pipe between them. Chris and i sit down on a nearby bench to "people watch." There couldn't possibly be a better seat on earth. Women dressed in the latest high fashion, totter to nearby clubs. Men in expensive suits discuss their latest business strageties. Little curly haired twins ride their motorized miniature car along the path way as mom and dad follow behind. It seems that every person passing has a completely different dress and accent. Before long my mind is constantly in a flurry trying to place the origins of people based on their dress and accent. i arrive fully aware this is a muslim country. i discover while we are there the goal is to have a mosque every 500 meters. Yet on Friday we attend a Christian church service. (That's right, i said Friday. It will take awhile for us to adjust to the Friday/Saturday weekend with work starting back on Sunday.) As it turns out, The Sheik (pronounced shake) of Dubai has given land for churches to build on and hold services. i would say that is very generous of him! Needless to say i am still trying to process the constant dichotomy here. 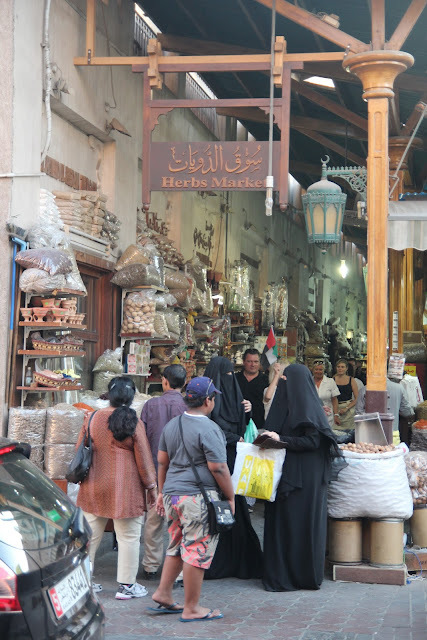 i took the following picture for the sole purpose of capturing the Spice Souk sign. (i will have to dedicate a whole post on just the spice souk!) Yet upon close inspection i realized i had unknowingly, captured a perfect glimpse of Dubai. The fascinating kaleidoscope of the old and new merging with the East and West. Awesome post friend. It looks like you soaked in as much as you could. God is good, all the time!